"I just received my set of 4 postcards, and I can't begin to tell you guys how totally AWESOME they are!!!! They look absolutely stunning - We are extremely pleased, plus you make my design work look like a million bucks!" Sample designs of the most common postcard printing format in the standard sizes of 4 x 6, 5 x 7 and 6 x 9. Vertical post card design samples of this popular postcard option used to accommodate a vertically oriented photograph or graphic design. Cards can be printed full color on both sides or full color over black at a slightly lower cost. 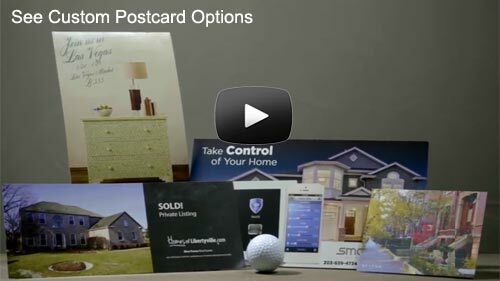 Examples of postcard designs printed with marketing messages on the back side. A good way to offer your prospects a more detailed explanation of your business, product or services, and catch their attention if they look at the back first. You can see how full color on the back can really catch your attention and improve the effectiveness of the mailing. Need help with your project? Call 800-­930-2423 now to talk to a print expert.